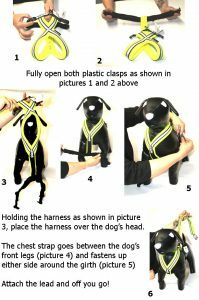 Undo the clips on the harness place it over the head, taking the strap between the front legs, fasten the clips up on either side to joining the clip housing along the back of your dog. After closing the two clips, make any adjustment as necessary on either side of the girth strap. A dog harness should be a snug fit but not restrictive, if it is too loose it can rub and cause chafing and possibly sore areas and means your dog may be able to escape out of it. You should be able to get one finger under both side straps of the harness. If it is your dog’s first harness, to accustom your dog to wearing a harness, start off by going for a walk immediately after putting the harness onto your dog for the first time, and then your dog will associate wearing it with a positive happy experience. Try leaving it on for a while, after walking to make sure your dog is comfortable doing things like rolling over in it and everything else to ensure the fit is correct.